Investor appetite for bank capital issuance from emerging market lenders shows no signs of abating, with Abu Dhabi Islamic Bank printing a blowout deal last week that was the first Basel III-compliant sukuk issue. The innovative Hybrid Tier 1 non-call six perpetual note offering raised US$1bn at 6.375% on the back of an incredible US$15bn book from 330 orders as private bank accounts, predominantly in Asia as well as in other regions, European fund managers, and even the odd sukuk investor scrambled to get their hands on the paper. “There was a huge response to the roadshow, which underpins the groundbreaking nature of the transaction,” said James Nelson, director, bond syndicate at Standard Chartered, which co-led the deal with HSBC, Morgan Stanley and NBAD. Rival bankers were critical of the execution process that saw pricing ratchet down by 62.5bp from initial guidance of the 7% area. “Investors are not happy when the pricing is dragged so tight and the books get so big in the process,” said one official. While acknowledging that the tightening was aggressive, bankers close to the deal argued that it was in line with the performance of other recent bank capital transactions. Gazprombank’s US$1bn perpetual non-call 5.5-year note issue started in the mid to high 8% range and was priced at 7.875%, for example, while a US$575m perpetual non-call six issue for Friends Life began in the mid-8% range before also pricing at 7.875%. “It was key to engage every investor in this price discovery process and test yield sensitivities, given the innovative nature of this trade,” said Souhail Mahjour, an official on the EMEA debt syndicate desk at HSBC. Part of the challenge for the leads was the wide range of investor views during the roadshow, with one account arguing that the notes should come at low to mid-5% at one extreme, while others sought 8% at the wide end. “You could drive a bus through investors’ views,” said one banker. One way to calculate fair value is to take ADIB’s outstanding senior 2016 notes, which were trading at a bid yield of 2.80% earlier last week, and work backwards. Assuming that a new 10-year non-call five Tier 2 issue from the lender would come 80bp back of that for the subordination and then a another 30bp or so for the curve extension, fair value for that bond offering would be in the high 3% area. Adding a further 150bp–220bp for the difference between Tier 2 and old-style Tier 1 for some emerging market banks takes fair value from high 5% to low 6%. As expected, private banks anchored the trade, taking 60% of the allocation, followed by fund managers at 26% and banks at 11%. By geography, Asia was the biggest recipient with 38%, followed by the Middle East at 32%, Europe at 26% and US offshore at 4%. 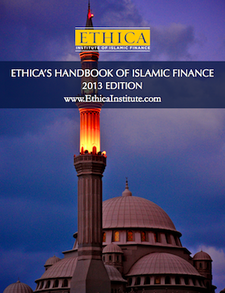 The sukuk investor base was a marginal participant in the trade. Key features of the structure include an issuer call option in year six and on every periodic payment date thereafter, coupon resets (without step-ups) every six years and non-cumulative coupon suspension (optional and mandatory), subject to a dividend stopper. One banker added that the Tier 1 structure was perfectly attuned with Sharia principles, given that the flexibility to cancel coupons and the perpetual maturity provided equity-like features to the instrument. The deal is unrated. ADIB’s senior ratings are A2/A+; Moody’s/Fitch. This entry was posted in Innovations and developments, Islamic Banks, Sukuk and tagged Islamic Banking, Islamic finance, Sukuk. Bookmark the permalink.